Today, I'm reviewing Voyage to the Bottom of the Sea (1961). This science-fiction film about a submarine crew who are trying to save the world from a deadly heat wave stars Walter Pidgeon and Joan Fontaine (photo above). 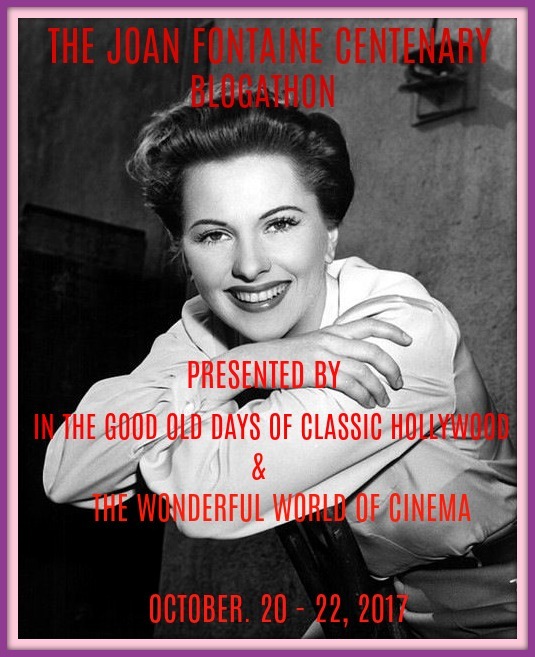 This article is part of The Joan Fontaine Centenary Blogathon hosted by In the Good Old Days of Classic Hollywood and The Wonderful World of Cinema. Voyage to the Bottom of the Sea (1961) is one of the more unusual films of actor Joan Fontaine's career. It's a schlocky science-fiction film from veteran producer/director Irwin Allen that features Fontaine as the psychiatrist aboard a nuclear submarine. Voyage to the Bottom of the Sea begins as Dr. Susan Hiller (Fontaine) arrives on board the state-of-the-art Seaview submarine for a stint on the aquatic vessel designed by brilliant engineer and retired admiral Harriman Nelson (Walter Pidgeon). Dr. Hiller soon settles into a routine of attending to the crew at the Seaview's sick bay and gossiping with secretary Cathy Connors (Barbara Eden) until a deadly heat wave threatens to destroy all life on earth. Nelson hatches a daring plan to end the heat wave by launching a nuclear missile into space (it's complicated), but his best efforts are stymied by a skeptical United Nations, reluctant crew, and Dr. Hiller, who labels the admiral mentally disturbed. 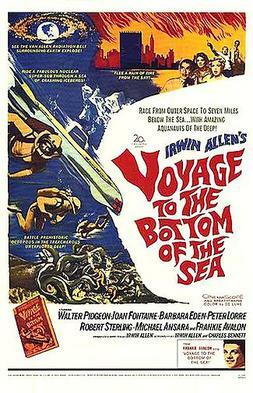 Voyage to the Bottom of the Sea was the brainchild of the ever-inventive Allen, who was hired by 20th Century Fox to make three family friendly adventures. Voyage to the Bottom of the Sea is the second of these three films -- the other two are dinosaur flick The Lost World (1960) and the Jules Verne adaptation Five Weeks in a Balloon (1962). The original script was by Allen and noted screenwriter Charles Bennett (The 39 Steps, Reap the Wild Wind), who based the movie's convoluted plot on the then newly discovered Van Allen radiation belts, which are zones of energized particles surrounding the earth's atmosphere (learn more from NASA here, or, if you want to descend down a dubious Internet rabbit hole, google "Van Allen radiation belts conspiracy theory"). Irwin filled Voyage to the Bottom of the Sea with impressive sets and special effects and a diverse cast that included old Hollywood veterans Pidgeon, Fontaine, and Peter Lorre, teen sensation Frankie Avalon, who also gets to croon the eponymous theme song, and newcomer Eden, who would go on to TV fame in I Dream of Jeannie (Eden also met her future husband Michael Ansara, who plays a bizarre stowaway, while making Voyage to the Bottom of the Sea). 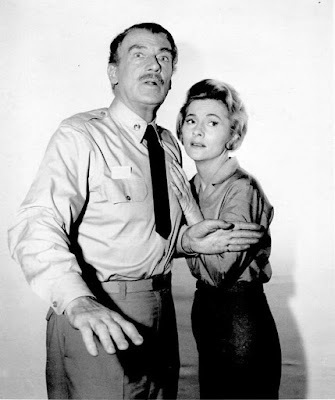 Voyage to the Bottom of the Sea received scathing reviews from critics, but it was a sizable hit with the public, and the ever-thrifty Allen went on to recycle the sets and costumes for a Voyage to the Bottom of the Seas TV series that ran from 1964 to 1968. This movie also set the template for Allen's later big-budget disaster movie like The Poseidon Adventure (1972) and The Towering Inferno (1974). For her part, Fontaine called the movie "horrendous" in her autobiography and admitted that she only took the role for the paycheck. Viewed today, Voyage to the Bottom of the Sea is certainly schlocky, although most of the special effects and sets are still quite impressive (just don't look to hard at the giant octopus). The plot is beyond nonsensical -- the film starts out as a standard underwater adventure before taking a left turn into murderous intrigue, international politics, and doomsday prophecies -- but that doesn't stop Pidgeon from having a grand time in a scenery-chewing performance that is half Mr. Miniver and half Captain Queeg. Fontaine, who takes on one of the few villain roles, doesn't really have that much to do other then look concerned and murmur something about Admiral Nelson being a "textbook case," but she certainly has a memorable exit in her Jaws-like final scene. I'll leave you with Avalon crooning the swoony theme song. Voyage to the Bottom of the Sea is available for streaming on Netflix. Also available on DVD and Blu-ray.